Season for Surrender by Theresa Romain is a smart, light-hearted, slightly unconventional historical romance. On the face of it, it’s a bluestocking heroine and a rakish hero meeting up at a holiday house party on the shaky basis of a wager between the hero, Lord Xavier, and his equally disreputable cousin, Lord Lockwood. Louisa is a quiet, respectable, studious, young woman who got caught up in a scandal when she broke off her engagement in the previous book. From this description, one might expect a standard trajectory of virgin despoiled by rake, forced to marry or thrown into some other awkward situation wherein the rake is reformed by the love of his heroine and the heroine is tutored in the ways of passion by the now-dutiful former rake. But that’s not quite what we get. Romain is great for this. She knows her romance and her hand at subtly subverting tropes is deft. Season for Surrender is an exploration of outer versus inner lives, society’s perception versus reality, and how even our opinions and expectations of ourselves can shift. Sometimes this is a result of external pressure, but in the case of both Alex and Louisa, they make conscious choices to be different from how they’ve been in the past. Despite his rakish reputation, Alex is smart and sensitive, a lover of poetry. Despite her quiet bookishness, Louisa is witty and adventurous. Early on in the novel, Lord Xavier and Lord Lockwood make a wager that Louisa won’t stay through Xavier’s entire house party. But the wager isn’t forced to carry the entire plot. Louisa discovers the bet early on and makes her own resolutions, heading off the potential annoyance of the heroine finding out about the bet late in the book and having that be the genesis of the black moment. I’ve seen that happen before in stories like these and I always feel cheated when it does. So I was relieved Romain got that out of the way early. Throughout the book, the party guests play games, reconfigure relationships and try on different roles. Xavier goes back and forth between thinking of himself as Xavier, the dissolute rake and Alex, the lover of poetry. This isn’t a pompous conceit. It’s indicative of a real identity struggle for him–of wanting to be different (perhaps better), but not knowing how or what would replace his current persona. Louisa’s journey is less transparent on page as her focus and energy is turned outward: observing the world rather than inward at herself. But Alex calls her on running away from him late in the book, shielding herself from potential hurt, but also putting emotional distance between them. He sees through her self-protective schemes and she realizes he’s right. She helps him in similar ways. It’s less about the two of them changing each other though, and more about them helping each other become the people they were always meant to be. One of the aspects of Romain’s writing that I appreciate most is that she’s really writing romance. I love a clever, convoluted plot and a large cast of richly drawn characters as much as the next reader, but Romain really focuses in on the couple. The main conflicts are their conflicts. Character growth happens for each individual, but also together as they help each other realize things about themselves they weren’t aware of before. Side plots (in this case, conflict with the increasingly desperate and disreputable Lockwood) are very much side plots. Not afterthoughts, never that. But to give the couple something to work through together that isn’t just gazing at each other adoringly. This was my third of this series and all have been consistently excellent. If you’re looking for a holiday house party read, Season for Surrender fits the bill. All the house party shenanigans are there, with whiffs of scandal and kissing under the mistletoe. But behind all the artifice is a really satisfying romance between two complex characters. I can’t recommend it highly enough. This recipe has nothing to do with Season for Surrender. But Theresa and I often discuss cooking and baking on Twitter (disclosure: we chat often) and so I couldn’t let this book go without putting some sort of recipe with it. 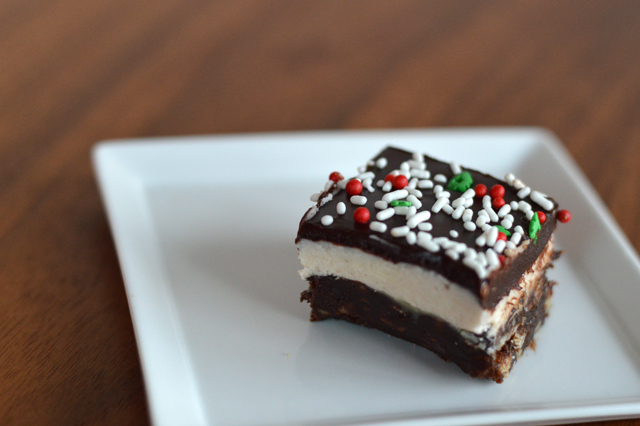 I decided to go with my holiday version of the Nanaimo bars I made in a bake-along with Jamaila Brinkley this week. I didn’t set out to make a holiday version of this Canadian treat, but I came home from work that day, realized I was out of both custard powder and graham cracker crumbs and decided to improvise. Also, I don’t like coconut, which is a staple ingredient in Nanaimo bars so I substituted slivered almonds. The bars are still delicious. In fact, more delicious for me because, well, no coconut. The recipe is pretty easy. There are three steps and you’ll probably use a lot of dishes, but none of the steps are particularly difficult. 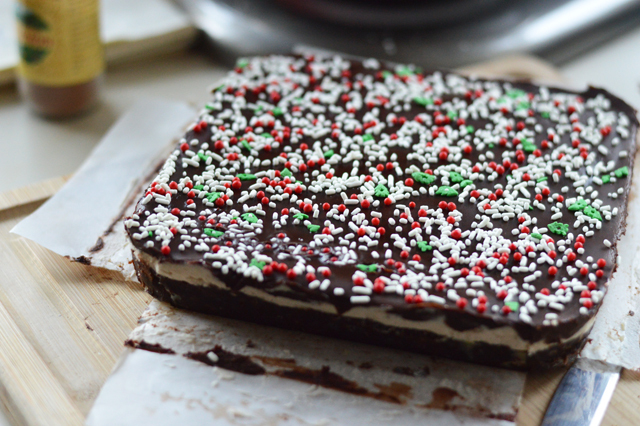 You could probably even double the recipe and make it in a 9-inch by-13-inch pan if you need a dessert to bring to a holiday party. 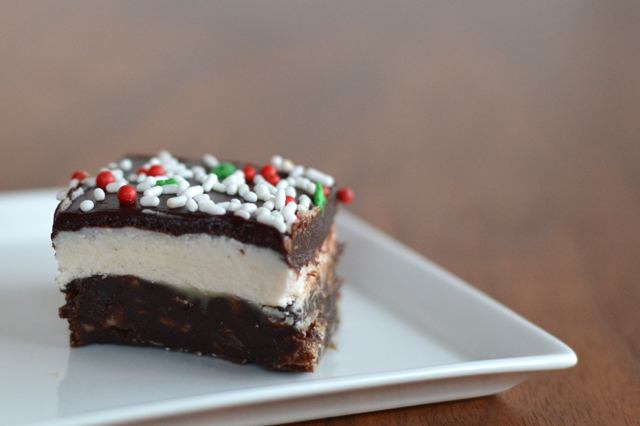 These bars, even cut small, are definitely rich enough to qualify as dessert. Plus I think the sprinkles are pretty cute. 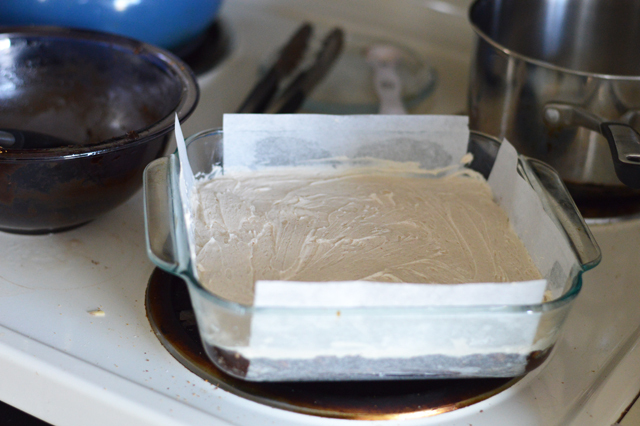 Prepared an 8-inch by 8-inch square pan with parchment paper. I buttered it just so it would stay stuck down into the pan, but it isn’t necessary. In a double-boiler (I use a bowl set over an inch of boiling water), combine the butter, cocoa powder, sugar and vanilla extract. Stir gently until chocolate is melted and all ingredients are combined. 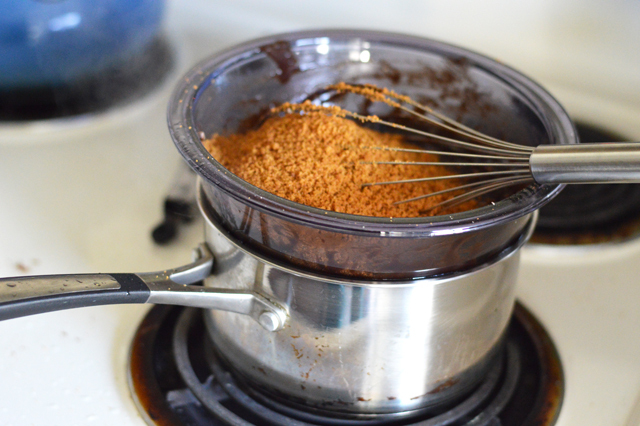 Whisk in beaten egg until mixture is the consistency of hot fudge sauce. Remove from heat. Stir in the gingersnaps crumbs, pecans and slivered almonds. Spread the mixture in the bottom of the prepared pan and place in the refrigerator. Combine the butter, cornstarch, vanilla extract and heavy cream in the bowl of a stand mixer with the whisk attachment. Whip until thoroughly combined. Add the powdered sugar, one cup at a time, whisking after each addition. I sifted it directly into the mixer bowl to prevent clumps. Whisk until the mixture is the consistency of frosting. Add the cinnamon and whisk to combine. Spread the mixture on top of the first layer and return to the fridge. Wash the top of the double boiler or bowl you used in the first step and return to a boil. Add the chopped chocolate or chocolate chips, butter and heavy cream and heat until chocolate is melted, stirring gently. Pour the final layer to the pan and smooth to cover the surface. Return to the fridge for 5 minutes before adding sprinkles as desired. Refrigerate for an additional 30-40 minutes for the chocolate to set, then cut into small squares. Store in the refrigerator.